Hey, lovelies! 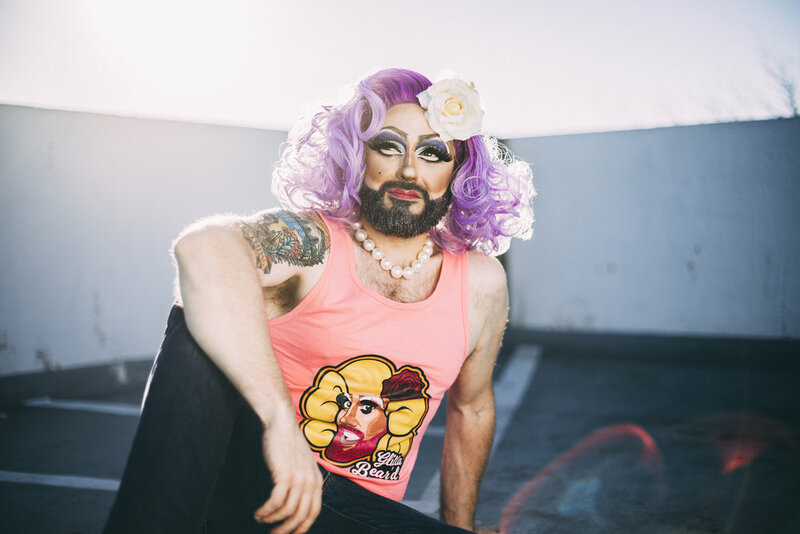 My name is Glitta Bear'D and I am a sparkly bearded queen based out of Cheyenne, Wyoming. 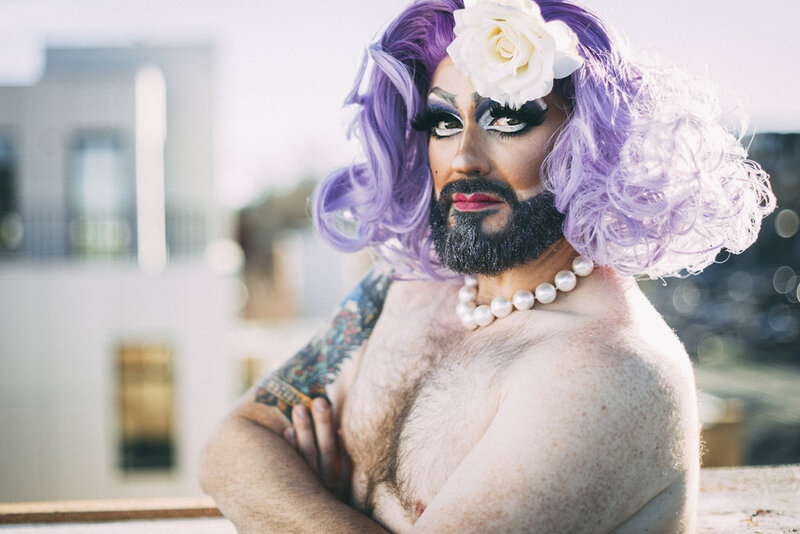 I started doing drag just over a year ago and in that time I’ve definitely found my aesthetic... a burly rockabilly Nick at Nite queen who, just like the glitter I’m addicted to, is known to stick around long after the party is over. When not spending equal parts of my free time beardazzling and applying beard oil, I enjoy making the most of life's random moments and spreading love (and glitter) to everyone around me. Some of my favorite places to perform are here in Cheyenne at the beautiful and historic Atlas Theater, as well as down in Fort Collins with the Glitter Drag Troupe at The Whisk(e)y. But just like the glitter that falls out of my beard, you never know where you’ll find me. Why do you do drag? What do you love most about it? So my story of drag, like many other drag performers, starts at Halloween. I’d been a big supporter of local drag for a few years and had developed some really great friendships with several performers. I admired what they did, not only their amazing makeup and outfits but their courage to get up there and perform. So for Halloween, 2016, I decided to try and experience what they went through as part of their transformation... if nothing more than to just appreciate their craft even more. To my surprise, however, I loved it. I experienced this confidence and pride that I didn’t feel I had in my day-to-day life. I was hooked and, with that, Glittoris Bear’D was born. The support I got from family and friends was amazing. With the encouragement of my Cheyenne sister—Oblivia, Queen of the Clueless—I made my stage debut for New Years Eve. Again, I experienced that rush of pride and confidence, but at a whole new level. It was during my second gig, however, that I truly discovered “Glitta” and the aesthetic that you see today. And I guess the rest is history. My first year of drag was amazing. I was not only able to meet and perform with so many incredibly talented and supportive kings and queens, but I learned so much from them and built even stronger relationships. It was like a whole new family, a community in which I felt so much belonging and pride. So for me, that’s why I keep doing it. I do it for the community that it’s not only a part of but the community it creates. What's your biggest drag challenge? I think my biggest drag challenge, ironically, is reminding myself that it’s ok if I’m not like all the other queens. It’s easy to get caught up in comparing myself to other performers, like asking myself why I can’t dance like them or why I can’t get my makeup to look like theirs, or why I can’t pull off lip syncing to a top 40 hit. I have to remind myself, and take pride in knowing, that I am my own special creation. It’s great to play around with makeup and try new things but at the end of the day I have to be me and not try to be someone else. So as much of a challenge as it is sometimes, I know who Glitta is... and so will you. What has been the best moment in your drag career? My best moments in drag haven’t been about the performances or the venues. For me the best moments have been the people at the end of the night who come up and thank me and tell me their stories. Whether it’s a story about coming out, a question about how they should go about starting drag, or just expressing that they had a bad day but because of the show they’d forgotten all about it, their stories are what keeps me going. So the best moments in my drag career are the people I meet, the friendships I’ve made as a result, and the growth I’ve seen in those people as they’ve embraced and celebrated who they are.